Before we get into it: look at that windscreen. What windscreen, you ask? Exactly. It’s tiny. Anyway. New cars are great and all, but sometimes you just want to tool around the French countryside and pretend that you’re in Le Mans. 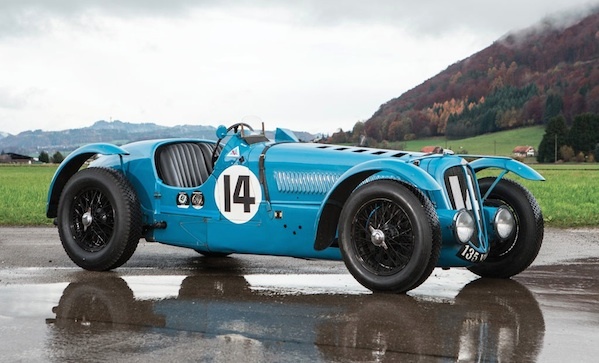 Which, in this 1935 Delahaye 135 S ($1,427,000 – $1,903,000), you could. After all, it raced in Le Mans in 1937, 1938, and 1938. Additional fun facts: it’s one of only sixteen of its kind, and its complete ownership history is known. Some hard numbers: 160 bhp 3,557 cc inline six-cylinder engine with triple Solex carburetors, four-speed racing gearbox, independent front suspension with transverse leaf springs and Raxef friction dampers, live rear axle with semi-elliptic leaf springs and Raxef friction dampers, and Duo-servo four-wheel cable-operated light alloy drum brakes.